prunt - A blob of glass applied to a glass object as a decoration, and sometimes drawn to a point or impressed with a pattern (raspberry prunt) or a mask (lion's head prunt). - "The History of Glass", Klein and Ward, Crescent Books, New York, 1984. Glass steins are difficult to research or study, due to the absence of identifying marks, codes, or a numbering system. Occasionally information can be put together to provide an explanation for a particular decoration or design. Such is the case here in regard to prunts, the often-overlooked decorations on numerous glass steins of the late nineteenth century. Basically prunts were drops of molten glass applied freehand or impressed with a tool on glass drinking vessels. Prunts were of various shapes and sizes and applied in patterns or haphazardly, usually to the lower two-thirds of the body. Horizontal single row patterns of from three to seven prunts were normal on steins of one-half and one liter sizes. Random applications on larger steins were not unusual, with prunts also applied to glass inlay lids. A Nuppenbecher of green glass from the 15th century. The prunts provide secure purchase for greasy hands. Nuppen, literally "drop", was the original 14th century prunt, and often placed on the Warzenbecher (literally, "wart beaker", ref. 1). The round drop prunts were applied freehand with a round rod glassworking tool. The glassworker dropped molten glass from the end of the steel rod, forming a round design, and as the tool was lifted away a small center tip remained on the prunt. A variation of that design was the pointed drop prunt which had a slightly longer tip that also extended from the center of the decoration. That prunt was very fragile and not applied to steins to any extent. Glass historians credit the German innovation as having been original, although recognizing that Roman glass-makers applied curled "tails" on glassware as decorations during earlier periods. Historians are fairly certain that the decoration originated in the glass houses of northern Germany, along the Rhine River, during the fourteenth century. At that time the various types of prunts were functional as well as decorative. The glass drops were applied to glass drinking vessels to allow the drinker a firm handgrip on the glass, in the absence of a handle. This was a practical innovation, at a time when forks for dining were unknown and the primary means of eating were a knife, which was usually carried by the individual, and one's (greasy) hands. By the early nineteenth century, prunts were considered antiquated, with no functional use on glass steins which by now had handles. Also, glassmakers apparently had little interest in prunts as an ornament at the time. The decorations were rediscovered in the late nineteenth century, as steins again became popular after the Biedermeier period. Prunts were used as a decorative device by both the English and the Germans, but not duplicated in other European glasshouses. The German prunts, considered exceptional decorations, were frequently referred to as raspberries, while the wider and flatter English versions were called strawberries. Colors vary, although many prunts matched the color of the steins, especially those on green glass. Various prunt colors also blended well with the traditional green glass and made attractive combinations. Not to be overlooked are the numerous clear glass steins with clear or colored prunts. In the balance of this article we will discuss several different types of prunts and look at some examples. The figure below shows some of the various designs in which prunts can be found. A look at some of the shapes which are used for prunts. The first row shows the side view of the prunt, while directly below is shown the head-on view. Fig. 1 - Dotted prunts on a half-liter green glass stein dated 1893. The six prunts were tool-impressed and arranged in a single row encircling the middle of the stein. The design originated in the 15th century, and even with nineteenth century variations, remained a distinctive decoration. Fig. 1a - A full view of the same stein. Fig. 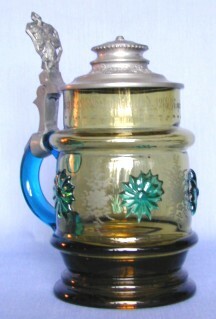 2 - A half-liter amber glass stein decorated with a type of blue star prunts (which appear greenish against the amber body) and a blue applied handle. Fig. 3 - A distinctive half-liter glass stein, with clear historical design. The glass has the green color of forest glass of northern Germany from the Middle Ages, and the Stachel Nuppen (thorn drop prunts) are applied in the 16th century fashion. Dotted prunts were impressed in relief, with a die which was a concave-faced steel tool. Two different methods were used in applying the ornaments: Simply explained, in one technique molten glass was rolled flat on a steel-surfaced glassworking table. The decorator cut out a prunt with the tool, retained it in the die, and stamped it on the stein. This method of "cut and stamp" produced perfectly shaped and neatly placed prunts as shown on the stein in figure 1. In the second method, the decorator dropped a small blob of molten glass on a stein and pressed the die to the glass which shaped the prunt. This method of "drop and press" produced prunts that were nicely shaped but not necessarily round. Often a slight collar of excess glass remained along the edge of the design. Dotted prunts were versatile decorations, and were often applied to different types of glasses in the late nineteenth century, especially on R�mers (a very popular form of wine glass with a hollow stem). The size of the prunts varied as well as the number of dots in the design. Often, dotted prunts on enamel-decorated steins were also enameled. While placing prunts, the glass worker had to maintain a hot, yet stable glass body. For that reason, the glass was still attached to the pontil, a long steel rod used as a glass-working tool. The craftsman submitted the glass to the heat of the "glory hole", which was an opening in the furnace at a low temperature location. As the worker decorated, he controlled the temperature of the glass, and the prunts fused in place. Prunts were also dropped freehand and some variations can be found in the several designs placed on steins. For example, molten glass for the round drop set up quickly and remained round and in raised relief. A similar but flatter design was applied in the same manner, but returned to the furnace glory hole for additional heat. The result was a flat decoration that increased slightly in diameter. 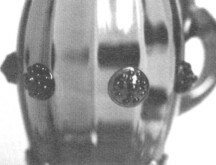 The pearl prunt was also a freehand decoration similar to the round drop prunt, but made with clear glass. The design was further decorated with an additional small drop of colored glass in the center of the decoration which gave it the appearance of a pearl. Thorn prunts originated in the sixteenth century. These prunts were dropped freehand with a long flat glassworking tool. The decorator dropped a blob of molten glass, and shaped the thorn tip as he lifted the tool away from the glass. The slightly oval shaped design, placed vertically, had a smooth tip which was practical for late nineteenth century steins. In the sixteenth century thorns were long and sharp, and the tips were often cut square with shears by the glassmakers. The Stachel Nuppen, literally "thorn drop", was applied horizontally and in numerous rows to tall, narrow-shaped Stangenglas, or "pole glass". The drinker placed his fingers and thumb between the rows of thorns and held the glass with the sharp tips away from the palm of his hand. Figure 3 illustrates a very interesting forest-green glass stein, with thorn drop prunts applied in typical sixteenth century fashion. The stein, however, is from the nineteenth century, as seen from the Biedermeier shape. 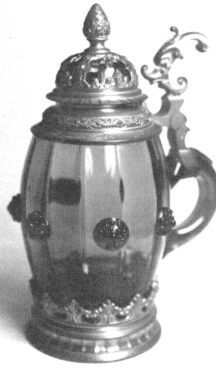 The stein bears an applied crinkled foot rim modeled after a Nuppenbecher of earlier times, and is finished with a late 19th century pewter dome lid and thumblift. We hope that this brief review of glass prunts is of interest to our readers and that it adds to our understanding and appreciation of German glass steins.